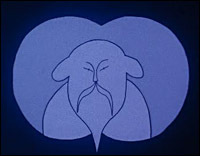 No Arks (1969) was the political cartoonist Abu's one and only animated film, funded by the British Film Institute during the period in which he lived in the UK and worked for the Observer. The film employs a simple and straightforward visual style that belies its complex message. Narrated by Vanessa Redgrave - a well-known supporter of nuclear disarmament - and produced during a time of international tension, anti-Vietnam sentiment and student activism, No Arks ultimately offers a pessimistic vision of the world, in which destruction is inevitable. What have this month's teacher's made of it? Don't forget to have a look at previous months' Show and Tell, which include two lyrical British Transport Films' productions, Terminus (1961) and Snow (1969), Ridley Scott's first ever film Boy and Bicycle (1965) and the poignant short Jemima and Johnny (1966), the unsettling animation A Short Vision (1956) and the urban short Cubs (2006).